Consulcongress was founded in 1991 as Congresses, Meeting and Incentive Division within the Travel and Tourism Consulindustria Group that have been operating in the tourist sector since 1975. Events organisation is the sector in which we have acquired in-depth experience, constantly refining and improving our service thanks to on-going updating; we support our Clients throughout the entire organisational stage. We offer a comprehensive service in the field of communication & public relations: organisation of international and national congresses, conventions, meetings; exhibitions, sports and cultural events, product launch and advertising campaigns. Thanks to the synergies created by the Group we are part of, we are able to suggest original solutions, both custom-made and creative. 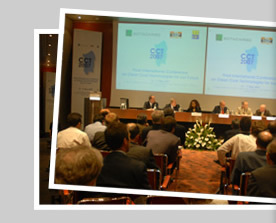 This allows us not only to design each congress, meeting or convention as a unique event, but also to manage it down to the tiniest detail with the guarantee for our client that it will be a complete, memorable success. we take it to heart and follow its development step by step as if it were the only one.